This webpage contains resources, activities and suggestions to complement the teaching of a case study on marine research aimed at Key Stage 3 and 4, focusing on prehistoric climate change. 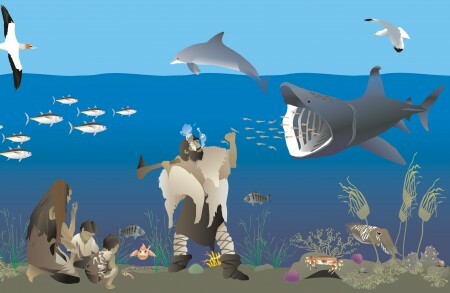 How did climate change affect prehistoric people? This case study explores the methods archaeologists and geologists used to create maps showing the potential location of prehistoric archaeological material on the seafloor. These maps will inform marine planning, allowing us to use the sea sustainably without damaging our underwater heritage. The case study supports the curriculum by providing a real-life application of science in the workplace. Areas of Britain’s seafloor were once dry land, where people could live. We examine how geologists and archaeologists reconstruct these landscapes, now submerged under the sea, to build up a picture of Britain’s past. In particularly we will look at the effect of glaciations and climate change on the people that lived around Britain during, and at the end of, the Ice Age. Click on the link and scroll back down to view the images in the lesson image bank. Images from our Geography Case Study for KS3 and KS4: How did Climate Change Affect Prehistoric People? What animals lived here in the past? You can find the Palao-arun reconstruction at Wessex Archaeology’s own channels. Links to other MALSF outreach material, the original REC reports and much more.